Philip Gustafson (right) is an SIUE Mass Communications alumni who has made his hobby in computer technology his career. After earning his degree from SIUE, Gustafson moved to Houston, Texas, where he pursed a career as a Technical Support Specialist and Trainer. He works for CSI Software, a leading provider of club management software for the recreation industry. Three and a half years later, Gustafson quickly moved up the corporate ladder to become Director of Educational Services. After being in the position for only a year, he developed the job into an essential part of the company. "The main focus of my profession is to create training materials for use by our customers, by our consultants in training our customers, and by our own employees to further their knowledge and training," said Gustafson. His biggest career challenge is getting the information for new product additions and then presenting them to customers in the most efficient, logical way. Advancements in technology in recent years have helped to make the process of product presentations more cost effective and resourceful. At SIUE, Gustafson majored in Mass Communications with an emphasis in TV and Radio Broadcasting because he enjoyed it. He also discovered an interest in Anthropology, in which he minored. While earning his degree, Gustafson worked at the Student Fitness Center as a computer technician during his sophomore year. At the time, SIUE had purchased a new computer program that Gustafson was responsible for learning and teaching to the rest of the staff. One day while on the phone with a support representative, Gustafson was asked when he would graduate. The representative encouraged him to apply with their company. Gustafson took the opportunity, was hired ten days after graduating from SIUE, and moved to Texas. Remembering his days at SIUE, Gustafson mentions Dr. Riley Maynard (Mass Com) and Dr. Julie Holt (Anthropology) as inspirational in his educational pursuits. "Dr. Maynard really touched me with his blatant honesty," said Gustafson. "Dr. Holt touched me with how much fun she made class and her willingness to go the extra mile to help her students," said Gustafson. 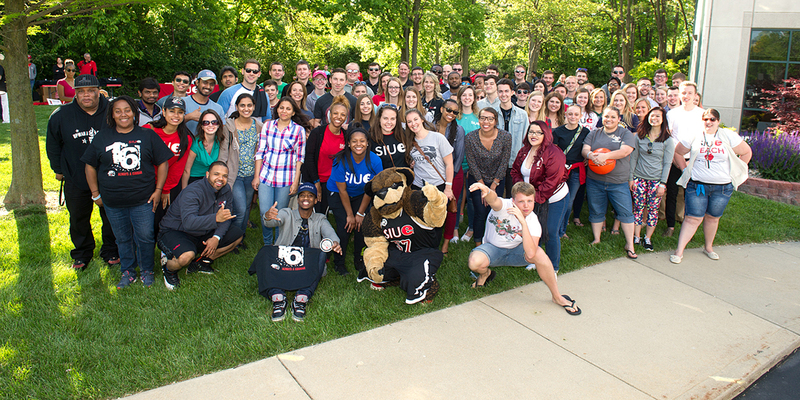 He tries to keep in touch with the faculty who he found made a special impact on him during his time at SIUE. Since graduating from SIUE, Gustafson has become an aviation enthusiast. "I enjoy flying commercially and privately, and on August 15, 2007 I successfully completed my checkride and became a private pilot," Gustafson explained. His passion for aviation drives him to volunteer at the 1940 Air Terminal Museum at the William P. Hobby Airport in Houston. Over the next five years, Gustafson sees himself getting married, starting a family and traveling. Gustafson's goals over the next ten years include: having his own fleet of aircraft, buying houses in several areas to accommodate his moods, and supporting an aviation-related charity, like Angel Flight or Lifeline Pilots.